Mercedes has revealed a brand-new teaser photo of the car meant to join the EQ family: the EQ A Concept. Set to make its debut at the Frankfurt Motor Show next week, the concept is the preview of an entry-level electric vehicle from the company’s new environment-friendly sub-brand. 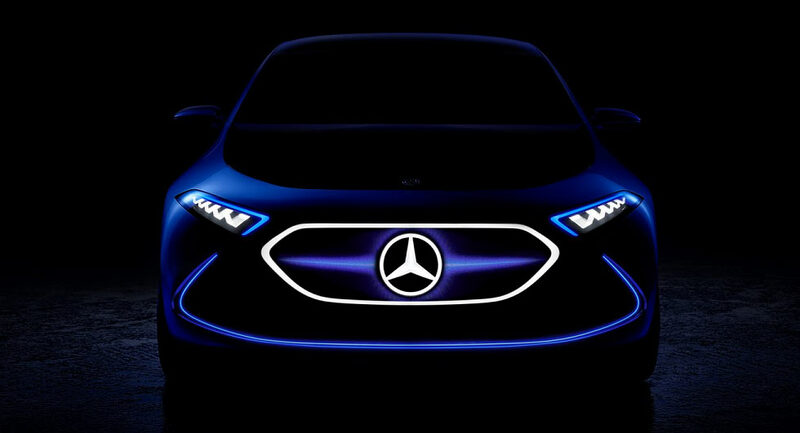 Not much has been said about the model that is going to be at the company’s stage in Frankfurt, yet the photo reveals that the concept sports a signal bar grille bearing the illuminated Mercedes-Benz three-pointed star logo. Distinctive layout with five luminous LED units, never seen before in the Mercedes range, make up the headlights. The vehicle will stand as a 5-seat 4-door hatchback underpinned by the all-new MEA platform, especially developed for the electric vehicles. The EQ A Concept will probably make it to the market in 2019, as a rival for BMW’s already famous and popular i3. It has been reported that the concept will be powered by a single electric motor that engages the front wheels. An eventual performance model will also feature a rear electric motor for extra power and all-wheel drive. The electric EQ A is expected to cost approximately $45,000 (38,000 euros) and Mercedes is counting on it to become the company’s best-selling electric automobile.